Spring is a great time for outdoor entertaining in the Winston-Salem area. The temperatures are mild, the humidity is still relatively low and the insects haven’t yet made their appearance in full. But all too often, newer homes in our area don’t seem to be built with outdoor entertaining in mind. Small porches and patios leave little room for a grill or a fire pit, let alone a group of chairs and a table. Adding on a deck is a great way to expand your outdoor living area, and the team at Rothrock Renovation & Remodeling has the experience to help create the perfect deck for your home. One of the most important factors to consider when designing a new deck, or renovating an existing one, is the type of material that will make up the floor. Not only does decking material provide the foundation for your deck, it is also one of the biggest design elements of the project, and the type of material you pick out dictates the look of your project. The material you choose plays a big factor in the total cost of your project. Here are a few options to consider when choosing your deck material. This is the most common material used in building decks, found in about 75 percent of decks across the United States. One of the reasons for its popularity is pressure-treated wood is the least expensive choice in decking materials. The wood is chemically treated to resist rot, mold and insects. The drawbacks of pressure-treated wood come with the routine maintenance necessary to keep it looking nice. Power washing and staining are recommended every two to three years. Also, because inferior grades of wood are used for this material, it is prone to cracking, warping and splitting. This is another natural wood option that is a higher quality than pressure-treated wood.. The natural tannins and oils in cedar make it resistant to rot and insects. Some people choose not to stain a cedar deck, as the wood ages to a nice gray color over time. However, we recommend sealing the deck to help reduce cracks and splinters. Cedar decks require the same type of maintenance as pressure-treated wood, with a pressure-washing every two to three years. Some homeowners choose to stain their cedar deck, and if so this will need to be refreshed every two to three years. Rothrock Renovation & Remodeling has installed some beautiful exotic wood decks at homes in the Winston-Salem area. Usually either Tigerwood or Ipe, this wood is more expensive than cedar and pressure-treated options, but the benefit is it lasts longer and requires less upkeep. These wood varieties are harvested from the Brazilian rainforest’s humid climate, which means they are naturally acclimated to resisting mold, rot and insects. The products are sustainably sourced, so customers don’t have to worry about harming the rainforests. Tigerwood comes in a variety of colors from light golden brown to reddish brown. Ipe, like cedar, will turn gray to silver with age if unfinished, but some clients choose to finish it for a glossy brown look. We usually recommend pressure washing and sealing or staining a deck made out of exotic wood about every five years. This is the fastest-growing segment of decking materials. 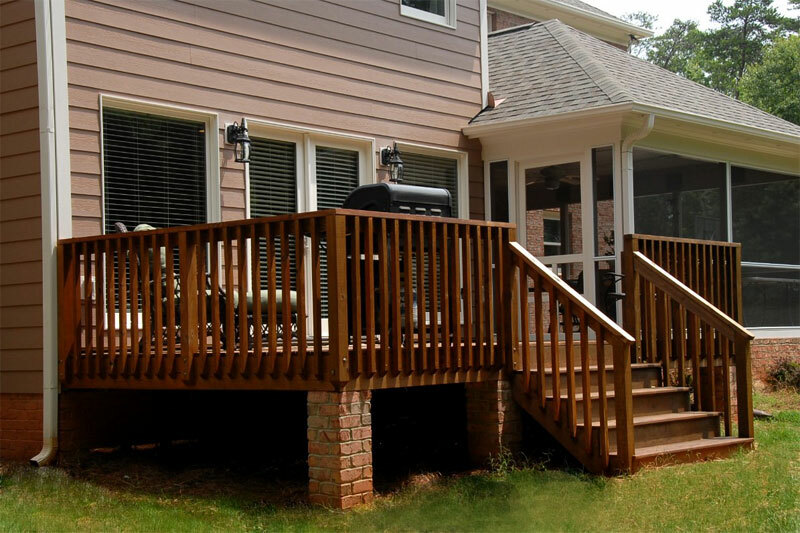 There are two types of composites: Wood-Plastic Composite (WPC) and Polyvinyl Chlorine decking (PVC). The difference between the two is that the WPC is a combination of wood particles and plastic components combined using an adhesive. PVC decking is all plastic, which makes it lightweight and durable. Capped PVC has a protective shell added to its surface to give it a more wood-like look. The benefits of composite decking is that it doesn’t warp or split, and it is impervious to rot and insects. It’s also virtually maintenance free, as it doesn’t need to be sanded, refinished or stained. The only maintenance you’ll need is an occasional pressure wash for mold and mildew. The drawback is composite decking costs about three times more than natural wood choices. Whether you choose to build a deck with composite decking, Ipe or pressure-treated wood, our experts and Rothrock Renovation & Remodeling can help you create the outdoor space of your dreams. The difference comes down to the cost and long-term maintenance. Ultimately, the type of material you choose to build your deck depends entirely on your project budget and personal preference, but with the right design you’ll have a finished product that brings you joy. 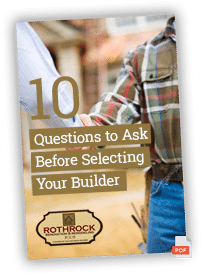 We’ve put together this short guide with some key questions that you should ask to help determine who to hire for your home improvement project. Download it below!